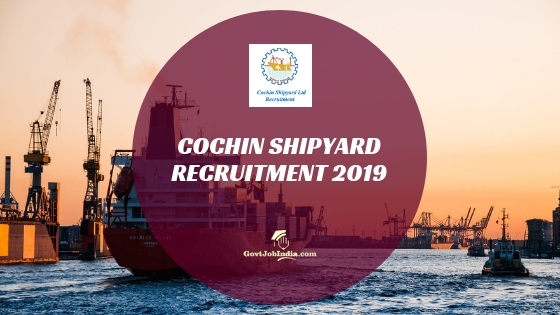 Kindly check the article below to know all about Cochin Shipyard Recruitment 2019. Applicants are requested to begin filling the online application forms. Online applications have already begun on the official Cochin Shipyard Limited website @ cochinshipyard.com. The same will end on 13th February 2019. 195 vacancies include a total of 3 major posts. These are Outfit Assistant, Fabrication Assistant, and Ship Design Assistant. Further, there are also various trade and discipline options under these 3 posts. Pay scale, education qualification, and experience required for all these posts vary from each other. Cochin Shipyard official website @ cochinshipyard.com will keep updating all the important details time to time. For sure the information will be showcased on other websites. But considering the official website would be better for all the applicants. Moreover, our team will add all the updates here the moment they are out. Bookmark the page so nothing is missed. Cochin, Kerala is set as the job location for CSL Vacancy 2019. All the recruitment details are mentioned below in tabular form. The official advertisement and Cochin Shipyard Limited website link are both attached at the end of the article. Check the “important link” section. contract 25 SSLC with ITI in the respective trade. OR SSLC with 3 years relevant experience. Candidates are requested to check the official advertisement for category-wise vacancies. The application fee is nil for posts A to G and categories such as SC/ST/PwBD. For all other candidates the application fee is set to be Rs.100/- + bank charges. Please note that the fees is to be paid through online mode only before the online applications close. Please also go through the CSL Recruitment Pdf attached to know more on education qualification, experience required and application fees. 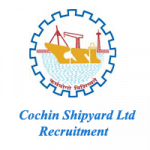 How to Apply for Cochin Shipyard Recruitment 2019 Online? On the homepage, applicants will see the option for “careers”. Click and scroll down the page. There would be E-Recruitment Contract Posts, under which is an option for “Vacancy Notification – Selection of Workmen on Contract Basis”. Fill only one application. More than one application from a single candidate will not be accepted. Applications are to be submitted online only under any circumstances. Proof of age, academic qualification, experience, caste, disability, and a passport size photograph is required. Fill in all the details and submit the online application. Take the print out and pay the application fees. Not down the registration number for any reference with CSL. Kindly ensure that the online application form for Cochin Shipyard Limited Recruitment is submitted before 13th February 2019. We hope the article above is helpful to gather all that is required. Let us know any of your questions and doubts in the comment section below and we will surely get back to you. For more govt job opportunities please check out the website with various options on academic qualification, location and sectors too. All the best!